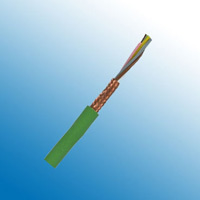 INTERBUS (IBS) are bus cables designed for use in high speed control requirements. These cables deliver precise data transmissions. Interbus cables are available in for stationary, flexible and outdoor applications. All versions are constructed with a tinned copper braid and foil shield for optimum protection against electrical interferences and have excellent data transmission characteristics. The stationary and flexing versions have an oil-resistant and flame retardant violet jacket to INTERBUS conformance requirements. The outdoor version has a UV-resistant black PVC jacket for direct burial and outdoor use.